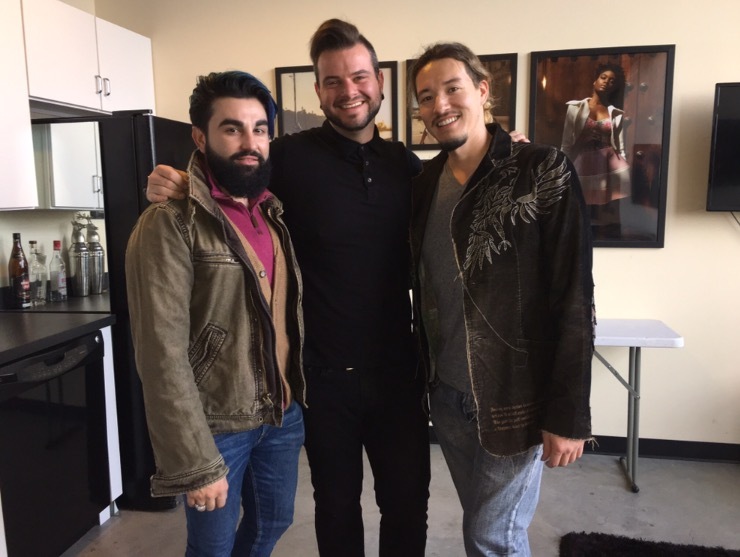 Gunnar Deatherage is a man of many talents; Designer, Stylists, Creative Director. I was excited when he contacted me regarding hair for his upcoming fashion spread for The Voice Tribune. I was very excited as he said curly hair and the shoot would focus on a generation of wealthy, fashionable women in a huge home. I was excited again to have the opportunity to work with make up artist, Bethany Hood and Photographer, Clay Cook would be photographing the collection. Models would be book from Heyman Talent Agency. I think one of the best parts of this photoshoot was is the home which served as the backdrop to this collection. The Conrad Caldwell Historical Mansion with its haunting energy was rich in beauty and history with a haunting vibe to the past. I was mesmerized by the house and intrigued by it size, high ceilings and original decor. Bethany and I did hair and make up to prep the models at Gunnar's studio. For hair I prepped the models with Redken's Guts 10 for subtle volume and then I sprayed Iron Shape 11 on sections of the hair and used various curling irons. I used the new Sam Villa Curling iron on all models and on the youngest model I used the Kiss 5/8 curling wand to set the hair. Clay Cook and his team did scouted various parts of the house to be used as backdrops to tell a story for the collection. Special lighting and test shoots were done prior to photographing the models. Special care was used when working with the actual antiques in the home which we were not allowed to move. The entire shoot last 10 hours and was published in the Fall 2017 Fashion Issue of the Voice Tribune. The collection was a featured fashion editorial in The Voice Tribune Fall Fashion Issue 2017. This collection was 1 of 5 shoots executed in the winter of 2016 for NAHA 2017. Although it was not nominated, I submitted the collection for publication and was honored to have it grace the pages of American Salon Magazine. In the past few years I worked with photographer, Clay Cook (whom I was nominated for a mens award in 2014). I had booked make up artist, Isidro Valencia and designer\stylist Genna Yussman Greene. Everyone was on board and loved the concept. For booking the models, I had couple in mind that I had recently worked with on other shoots. I was so happy when they all agreed and were available on the day I had set up with the team. 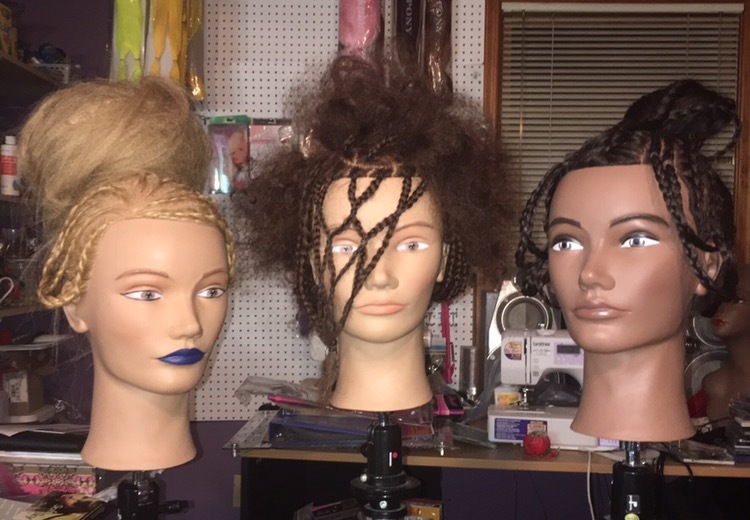 Practice was imperative and I chose mannequins that had hair similar to the models I had booked. I spent a few weeks practicing different looks on them. I would at some point finish the look somewhat satisfied and wood return the following day to see if I was still feeling the hairstyle. If I didn't speak to me, I would redo the stylet. If it did then I sought to enhance the overall look. I practiced the styles for several hours over a couple of weeks on Pivot Point Mannequins. I would send text images of my mannequins to Clay and Isidro so they would have an idea of where I was taking the hair. The Day of the shoot was on a Sunday at Clay's studio. I made sure to have lots of food and drink on set for the models. The shoot lasted for a total of 7 hours with at least 2 hours prep for each model. Wardrobe was easy as all models would be adorned with the large necklace. I remember being exhausted with tired hands after the shoot but I was happy because I knew we had made something amazing. I tend to always overpack for photoshoots so I had plenty of hair extensions, irons and products at hand. The fun part is always creating the mess but not so much the clean up. I invited Derek Hibben on set to take bts images and he did an fantastic job. 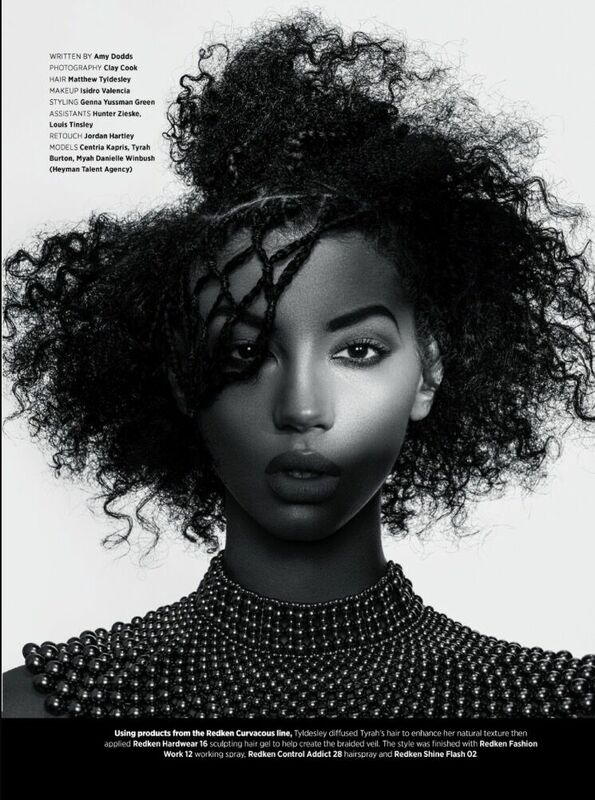 The looks were inspired by Asian and African hairstyles and from my own imagination. Having a team is so crucial, I love working with Isidro he is able to balance the hair with the appropriate make up. Genna always have amazing ideas and always has really unique fashions and accessories. Working with Clay is always a pleasure, he has a great eye for balance and brings his creative touch to every project. On model Centria I flat-straighten her long hair using Redken's Iron Shape 11. I deftly cornrowed her hair with Braid Aid 03 on scalp then transition the braids off scalp. I secured a high bun on top with elastic cord and adorned it with some of the smaller braids securing each layer with Fashion Works 12. I finished the look with Control Addict 28 and lots of Shine Flash 02. On model, Tyrah I diffused her natural texture and used clips and the heat of the hair dry to create and sustain the separation (space) in her rounded hairstyle. I then applied Hardward Gel 16 styling gel to create the braided veil. I did tiny brides around her hairline then forged them together at certain points with black rubber bands. I finished the look with Control Addict 28 and Shine Flash 02. Profile shot of Tyrah and the "braided veil"
For model, Myah I did a directional blow dry the cornrowed her hair with Braid Aid 02. I added several wefted hair extensions that were micro crimped using the Sam Villa Texur Iron and formed into a disheveled, textured bun. I used Fashion Works 12 to separate the style and finished with Control Addict 28 and Shine Flash 02. For make up I gave Isidro free range. I had sent him only a couple inspirational images. I only request a strong lip of which we choose a bright tangerine for contrast. He created a beautiful arched brow and soft smoky eye. Post shoot Clay asked if I would be open to Black and White and I agreed as it would give a strong effect. I submitted the images to Amy Dodds of American Salon Magazine. She loved the images and asked for them exclusively for print in the August 2017 issue. I was thrilled as was the entire team. Seeing our work in print is an amazing experience I am so thankful to Amy and the team. I am so grateful for everyone involved in this project. Below is the bts making of video of "Twisted Roots"